The 2019 recreational salmon season opens this Saturday from Horse Mt. down to Point Arena, which includes Shelter Cove and Fort Bragg. Pictured is Riley Skillman from Mesa, AZ with a nice Shelter Cove king salmon from last season. It’s finally getting to be that time of the year again as the North Coast recreational salmon season will kick-off this Saturday from Horse Mtn. south to Point Arena, which includes the Shelter Cove and Fort Bragg areas. Large numbers of salmon, 274,222 Klamath and 379,632 Sacramento are said to be swimming in the ocean, which brings with it loads of optimism. Encouraged by the number of salmon in the sea, the PFMC has provided a lengthy recreational season in 2019. The three season alternatives for Fort Bragg and Shelter Cove, which all have the season opening on April 13, are currently being reviewed by the PFMC at their meeting in Rohnert Park. The season closing dates will either be Oct. 31 or the season will close May 31 and reopen June 22 and run through Sept. 30. All three scenarios are the same, two fish per day, seven days a week, Chinook only, 20-inch minimum size. Here locally, from the CA/OR border to Horse Mtn., our season is slated to open on May 25. The three alternatives have the season closing on Sept. 8th, 4th, or 2nd. In the San Francisco area, the three alternatives are the same as Shelter Cove, with one exception. The minimum size limit is 24 inches through the end of May, then 20 inches thereafter for each of the alternatives. The Monterey area, from Pigeon Point to the U.S./Mexico border, opened on April 6. 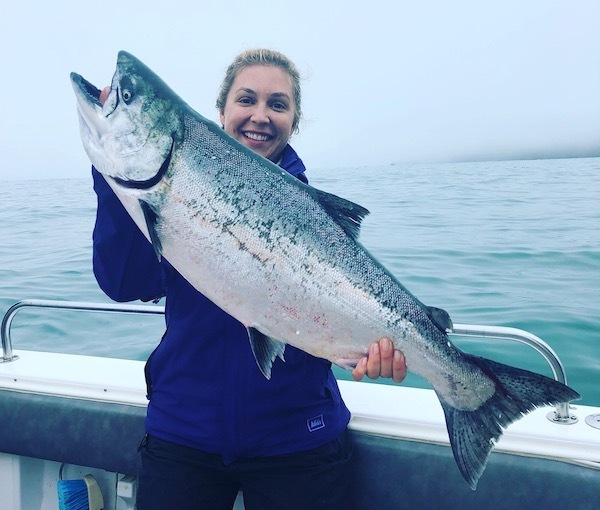 Reportedly, there’s a lot of salmon around Monterey Bay, especially in the Moss Landing area, and plenty of limits were had by both charters and private boats over the weekend. “The weather for this weekend’s opener is looking halfway decent for a change,” said Jake Mitchell of Sea Hawk Sport Fishing. “It doesn’t look like we have any big tides or abnormally large swells to deal with. Although there hasn’t been much traffic on the water lately, the reports I’ve been getting sound very encouraging. There seems to be a fair amount of bait around and couple different people have told me they’ve seen salmon on a few different occasions. I expect it to be a good year with all the small fish we saw last year, but we’ll have a better idea after this weekend.” According to Mitchell, the launch fee will be $35 and they’ll probably be just one tractor for the weekend. The launch will run from 6 a.m. to 4 p.m. For launch information, call 707-223-1600. RMI Outdoors of Eureka will be holding their first Screamin’ Reels fishing contest beginning on May 1 and running through Sept. 2. There are three categories: ocean salmon, Pacific halibut, and lingcod. You can enter up to five fish per day, but only two ocean salmon, two lings, and one Pacific halibut per day. An RMI Outdoors associate will weigh your catch, fill out an entry form, and take your picture for the brag wall. All salmon must be gutted and gilled; anglers must have a valid 2019 fishing license; Fish and Wildlife regulations apply. Each angler that brings in a fish has a chance to win a $100 RMI Gift Card. Visit http://rmioutdoorseureka.com/whats-going/screamin-reels-fishing-contest for more information. The Southern Trinity Volunteer Fire Department is hosting its 13th annual Ruth Lake Bass Tournament on Saturday, April 27. Blast off begins at 6:00 a.m. Entry fees are due April 26. Entries are $150 per team (includes Big Fish). First Place is $1,500 and second place is $1,000. Big Fish will win $100. One in five payback based on full slate of 40 boats. This is a catch and release tournament; live wells and life jackets are required. Check in is Friday at Journey's End at 5:00 to 7:00 p.m. or Saturday at 4:45 a.m. at the Marina parking lot. HBMWD is requiring that all boats be inspected for Quagga and Zebra mussels before launching. For more information, call RLCSD at 707-574-6332. For more info on the tournament, contact Doug Dinsmore at (707) 499-8485.